Another Pete Dye creation at Casa de Campo, “Dye Fore” has spectacular views of the Caribbean Sea, mountains, the Chavon River below and the Altos de Chavon artists’ village. 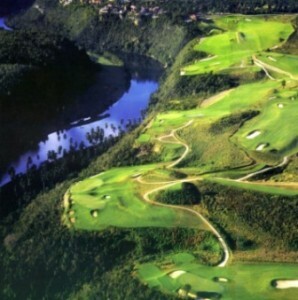 Visually, the course is intimidating and the par 3’s are incredible! Although very playable from the white tees, this course will stand the test of time as it measures 7,700 yards from the championship tees. This course is the first planted from its inception, with two new grains of grass that thrive on salt water. Now Dye Fore offers 27 holes of exciting play.